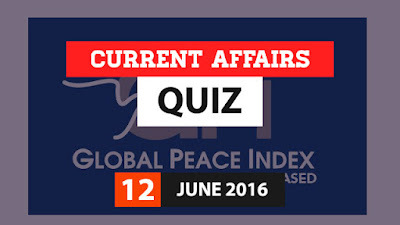 Hi Aspirants, here is the Current Affairs Quiz for 12 June 2016 useful for all upcoming exams. 1. 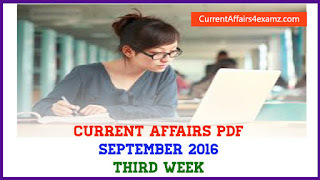 ____ on 11 June 2016 became the first state in India to have an open government data portal? 2. Former Chief Minister V. Vaithilingam was elected unopposed as the Speaker of ____ legislative Assembly on 11 June 2016? 3. India, Japan and United States (US) navies have kicked off 2016 ____ trilateral naval Exercise near South China Sea? 4. Union Railways Ministry has flagged off Champaran Satyagrah Express train at a function in Motihari, Bihar on 11 June 2016. Champaran Satyagrah Express train has been introduced to mark 100 years of the historic Champaran Satyagraha (movement) launched by Mahatma Gandhi in? 5. 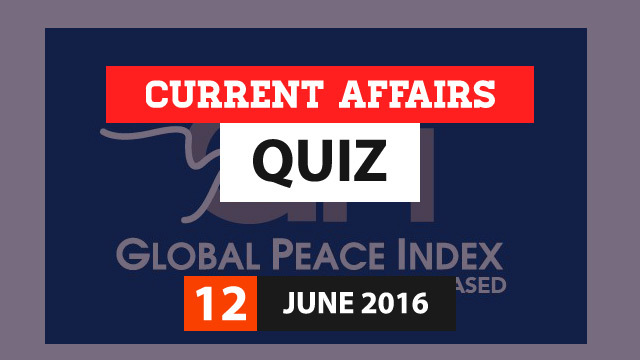 India was ranked ____ on a Global Peace Index (GPI) for year 2016 out of 163 countries? 6. Which country topped 2016 Global Peace Index? 7. Union Ministry of Power on 11 June 2016 has launched Surya Mitra mobile App to serve customers in the field of renewable energy. The app was launched by Union Power Minister? 8. Which bank has recently launched India’s first internationally-listed certified green bond to finance climate change solutions around the world at London Stock Exchange (LSE)? 9. Which country on 9 June 2016 honoured UN Secretary-General Ban Ki-moon with Order of Friendship Award? 10. Which country has topped in the list of 19 countries figuring in the 2016 Malware Infection Index (MII) in the Asia-Pacific region?